As a follow-up on #8085 I would like to propose a few changes first to com_contact and later on to com_users as well. While there are a couple of code style changes in files that are not directly related to com_contact, I thought it would be good to include them in this PR since they were edited in the same context. The last PR allows us to override and / or add fields to the contact form via plugins without the need to create a template override because the rendering is based on the xml file. As discussed in the comment section in #8085, we normally want to use the renderField method instead of writing things like echo $field->input. For that, a component specific renderfield override had to be created, which I did with this PR. The method used to check for a required state and / or field of the type label is not very clean but should suffice for now. I normally would have created or rewritten the fields and their layouts but that would have been too much for this PR and, as @wilsonge told me, that is planned for the near future. Take a look at layouts/joomla/form/field/radio.php to see where this is going. Refactor the form layout to make use of the renderField method. In doing so, the legend for each fieldset (if present) will be taken from the xml file and the markup for each field will be based on the renderfield.php and the respective layout. As a bonus, the contact form now supports the showon-Attribute. Some language strings, like the fieldset label and the "Send copy to yourself" have been changed. The form markup was changed to match com_users.registration and login which includes adding a "well" CSS class suffix to the form. My goal was to unify the output / markup, to fix some bugs and add some functionality to all of the forms of com_contact and com_users (registration / login). Long story short, how to test? Well, first of all, this only works for the latest dev branch. Second, after applying the patch the output should look like in the second picture. Apart from that you can follow the test instructions mentiond in #8085. I've uploaded a new version of the test plugin here. If you have any questions, suggestions or corrections feel free to contact me. This adds a component specific renderfield JLayout override. 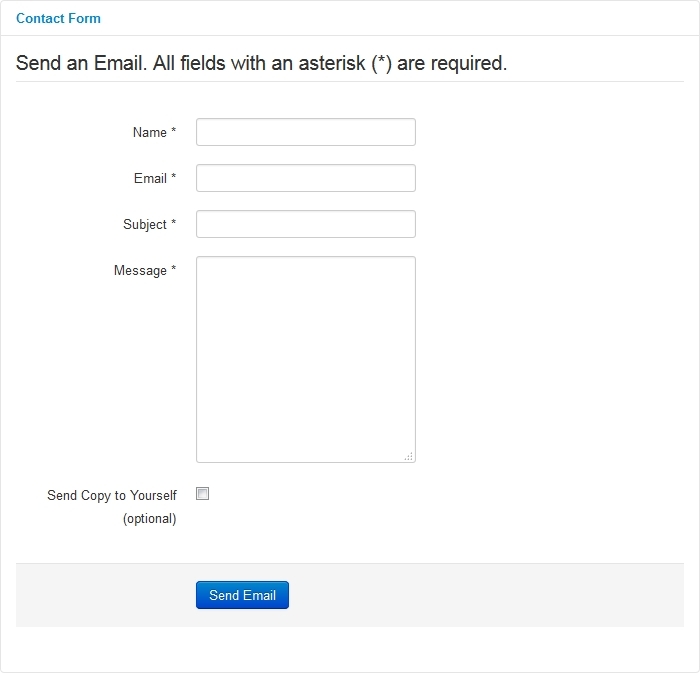 The "optional" addition to the label for required fields was moved from the com_contact form layout in here to be able to use the renderField method in the layout file. Change contact form fieldset label to match the com_users schema and add component specific "* Requied field" "constant"
Besides reordering the label and description attributes in this file which, to be honest, was more about finding peace and satisfying my OCD, I've changed the fieldset label to match the format that is used in com_users and added a spacer label to output the *Required field hint for the form. I saw, the new way to gather variables is "extract" (used in several other layouts/tmpl), in personal I think, that's not a solid way to code (often mentioned in "bad coding practises). Perhaps that function should be reviewed in Joomla! general. Otherwise the PR looks very good. Awesome work! This comment was created with the J!Tracker Application at issues.joomla.org/joomla-cms/8473. Tested on FF 40 - the output looks like the second screenshot. An empty <fieldset></fieldset> is in the html code, if no Captcha is used. @matrikular looks good here i can confirm the findings by @ufuk-avcu as well as i agree to use the nativ and not the string helper strlen function. Thank you for your comments and tests. I replaced the StringHelper::strlen method with the nativ strlen function and extended the foreach loop to only render the fieldset when captcha was enabled. It would mean a lot to me if you could test it again, please. This PR has received new commits. @brianteeman thank you for your input. I would like to see the addition of the well class suffix to the form more of a bug fix than a potential b/c issue. If we look at the registration and login view of com_users e.g, both forms have the well suffix. 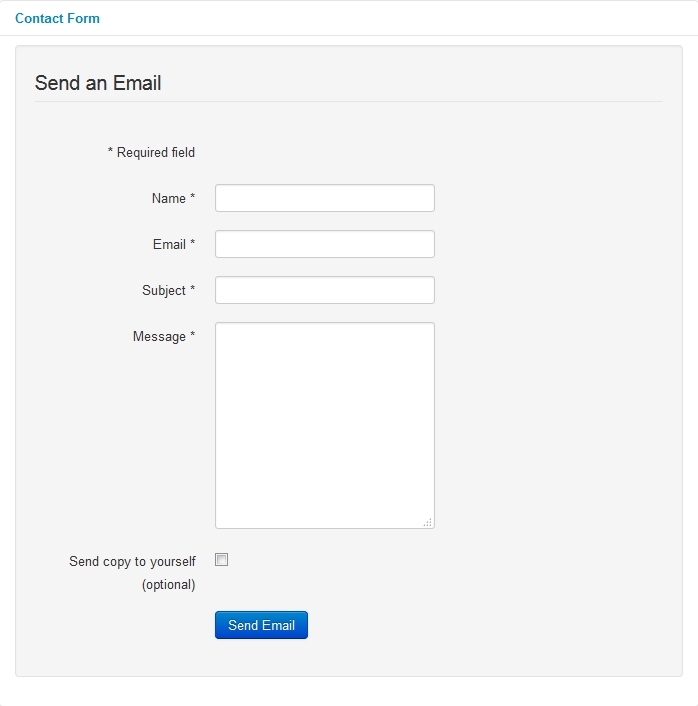 Adding it would add to the general user experience (forms look like "this" ~> POLS). I've checked approx. 50 sites (google / j.org showcase) where this would have no negative impact. It would change the layout on all sites that I have built. Not sure how happy I am about that. Templates aren't covered by our B/C policy. So this PR doesn't have to be backward compatible in this regard. Adding the well sure will not break any template functionality. It will obviously change appearance on most templates. The real question in the end thus is if it is considered an improvement or not and if it's worth it. Tested it as described. Works as expected. Fine work. COM_CONTACT_FORM_LABEL="Send an Email. All fields with an asterisk (*) are required. This is not B/C as the language packs can be used on pre-3.5.0 installs. I am making a PR for that. As mentioned in joomla#8473 (joomla#8473), ... as long as we cannot access the field properties properly, this seems to  be the way to go for now.